The suicide attack that killed Benazir Bhutto cut short an epic life, one bathed in blood and awash with controversy. Bhutto’s father was hanged and a brother was shot to death. She had risen to become the Muslim world’s first female prime minister, only to lose office and flee Pakistan for most of a decade in the face of accusations she was corrupt. And when, finally, she returned in October to marshal the opposition against President Pervez Musharraf, her homecoming parade in Karachi was targeted by a suicide attacker. More than 140 people, died, but the 54-year-old Bhutto escaped injury and threw herself into the campaign. “We have to modify our campaign to some extent because of the suicide bombings. We will continue to meet the public. We will not be deterred,” she said then. Her father was Zulfikar Ali Bhutto, scion of a wealthy landowning family in southern Pakistan and founder of the populist Pakistan People’s Party. The elder Bhutto was president and then prime minister of Pakistan before his ouster in a 1977 military coup; two years later, he was executed by the government of Gen. Zia-ul Haq after being convicted of engineering the murder of a political opponent. A year later, her youngest brother, Shahnawaz, had died under mysterious circumstances in France; the family insisted he was poisoned, but no charges were brought. The elder Bhutto had sent his daughter to study politics and government at Harvard and then at Oxford, where she was elected to lead the prestigious debating society, the Oxford Union. Bhutto returned to Pakistan after he father’s death, swearing to continue his work. She was detained several times before being exiled to England in 1984. Two years later, she returned again to lead rallies for the restoration of civilian rule. After Zia’s death in a mysterious plane crash in 1988, Bhutto gave birth to the first of her three children. Beautiful, charismatic and articulate, she led her party to an election victory and became the first woman to lead a modern Muslim nation. Her first administration was clouded by allegations of corruption and clashes with Pakistan’s powerful military; her administration was dismissed after 20 months. She was re-elected in 1993. But three years later, her brother Murtaza died in a gunbattle with police in Karachi; Bhutto’s husband, Asif Ali Zardari, was charged with his murder. The charges eventually were overturned, but Zardari spent eight years in prison on those accusations and others involving corrupt dealings allegedly amounting to millions of dollars. Benazir accused President Farooq Leghari of involvement in Murtaza’s death, and Leghari dismissed her second government amid fresh allegations of misrule. She sought to lead a third government, but lost to archrival Nawaz Sharif in 1996. She left Pakistan in 1999, just before a court convicted her of corruption and banned her from politics. The verdict was later quashed, but she stayed away until Musharraf signed an amnesty, halting any corruption charges against her and others. Her return was triumphant, but fraught with peril. She was defiant to the end. “Bhutto is alive! Bhutto is alive! 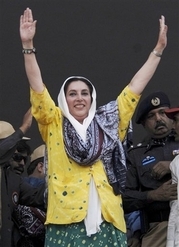 Bhutto is alive!” she shouted at a rally in December.